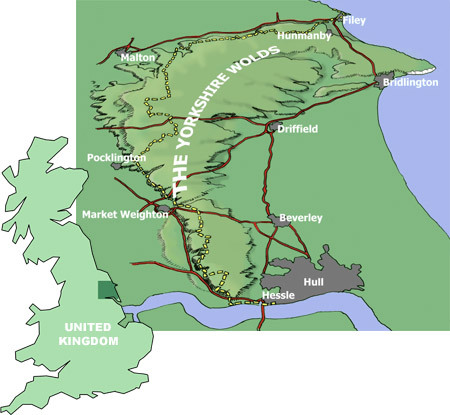 The Yorkshire Wolds are a range of low, rolling hills which rise from the River Humber at Hessle and run in a crescent curve (which reaches a height of about 250 metres) culminating in the east with the dramatic cliffs of Flamborough Head and Bempton, north of Bridlington. The solid, mainly chalk geology of the Yorkshire Wolds is the most northerly outcrop of chalk in Britain. For thousands of years man has found the raw materials here for agriculture, industry and the built environment. The area includes some of the most fertile and intensely farmed agricultural land in the country, particularly in respect of cereal crops. The Yorkshire Wolds is an archaeological landscape of international importance. Major sites and monuments include examples of Neolithic, Bronze and Iron Age burials, ritual complexes and prehistoric dyke systems. The area is particularly rich in deserted mediaeval villages. Chalk grassland is now an extremely rare habitat in Britain and this is the most important semi-natural wildlife habitat remaining in the Yorkshire Wolds. A wide range of plants and insects are largely confined to chalkland. Positive management schemes are needed to maintain and to enhance the present flora and fauna, some of which may be lost forever without adequate protection. Scrub growth is a very real threat to the remaining grassland areas on steep valley sides. This is a rich but tranquil landscape through which runs the Wolds Way from Hessle Foreshore to Filey Brigg, a walk to enjoy for its intimacy and serenity. The course of the Wolds Way is shown on the map above with a broken yellow line. Here in the Yorkshire Wolds there is a superb opportunity to explore and understand how people have interacted with their environment through successive layers of history over thousands of years. An integrated approach is not only interesting in itself but the best way of safeguarding a sustainable future.